For the residents of the Plattsburgh area, Harrigan’s Soft Ice Cream is a summer staple. Originally built in 1959 by Francis and Barbara Harrigan, the ice cream stand started out as part of the Tastee Freeze franchise. After years of success, the business slowly acquired more local suppliers and officially became Harrigan’s Soft Ice Cream, expanding on its reputation for serving up excellent products and great service. Today, the business is owned and operated by Pete Harrigan, son of the original owners. Harrigan purchased the business from his parents about 25 years ago and has enjoyed keeping up the family’s legacy. Many of the lessons from his childhood continue to shape and guide the way he leads the business. Harrigan’s parents made a huge impact on him growing up. His mother, Barbara, ran a business on the side while raising nine children. His father, Francis, used to work from early hours in the morning to midnight almost every night, on the farm, at Clinton Correctional Facility, and then at the ice cream stand. 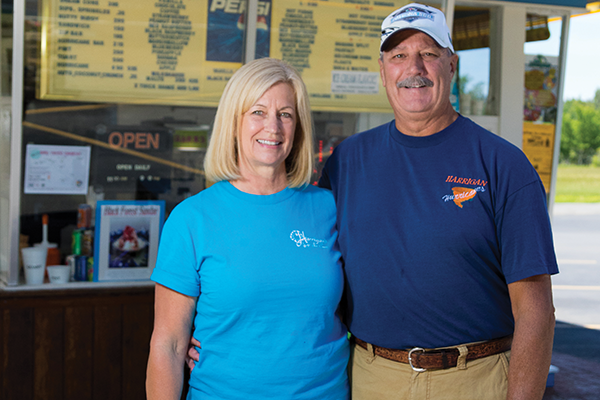 The business of operating and maintaining a soft serve ice cream stand is no simple task. It requires discipline, consistency and a heavy focus on cleanliness. For Harrigan, maintaining the original building is something he takes great pride in. “People ask me how old the building is because they think it was just built a couple years ago,” he said. Harrigan also takes pride in his staff. “We have some the best kids in the North Country working for us,” he said. Some of his employees have built up quite a tenure. One employee has been there for 12+ years. The past few years at Harrigan’s has produced some fun and exciting new treats for customers to try. Last year, for example, Harrigan introduced the “Patriot Parfait”, which is a parfait that includes a vanilla ice cream base with red raspberry, marshmallow, blueberry toppings, whipped cream, and (of course) a cherry on top. Another new item on the menu is the indulgent “Black Forest Cake Sundae”. This treat starts with a piece of chocolate cake and then has a hot fudge sundae placed on top. To finish it off, the sundae also receives additional cherry topping with whipped cream. One cannot forget another popular treat from Harrigan’s that customers have been enjoying for more than a decade — the “Harrigan Hurricane”. These soft ice cream treats allow customers to pick from ten different candy toppings that are whipped into their favorite ice cream flavors. At this time, Pete Harrigan is thoroughly enjoying the opportunity to carry on the quality and tradition of Harrigan’s Soft Ice Cream. No urgent plans for the next generation of the business have been made at this time, but his son has been training with his father and his daughters may have some interest in the business as well. “The other kids are like our kids, too,” said Harrigan, referring to his loyal staff. For now, and many years to come, local residents and visitors can expect to continue enjoying the North Country gem we call Harrigan’s Soft Ice Cream.